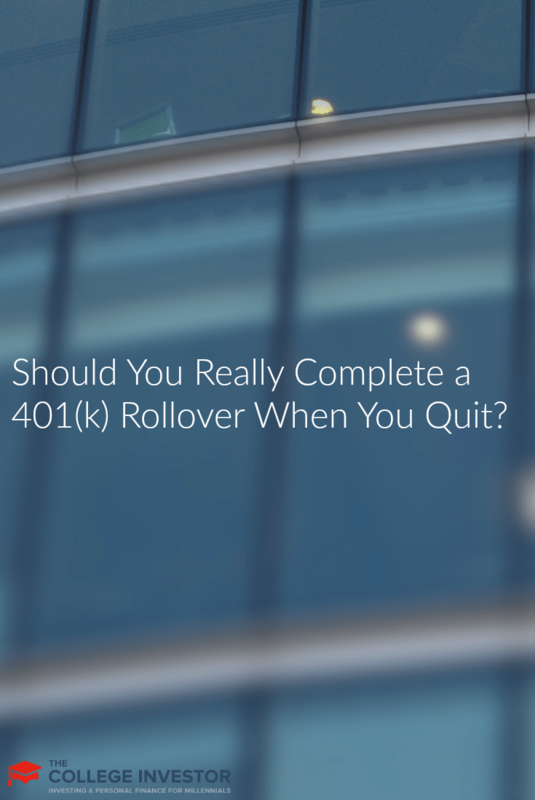 Should You Really Complete a 401(k) Rollover When You Quit? 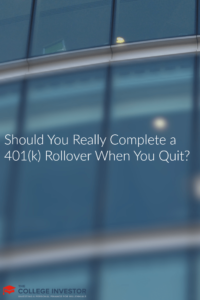 Home » Should You Really Complete a 401(k) Rollover When You Quit? Recently, I left my employer of four years and one of the many things I had to consider was what to do with my 401(k). I never realized how much work it was to leave your job: I had to figure out which day I was going to quit on, what to do with my 401(k) and HSA, and I even had to get new health insurance. Although I started off my career with contributions only up to the company match, I made sure to increase my contribution every time I got a raise or merit increase. After a couple years, I had finally maxed out my account and after four years, I had a pretty significant amount waiting for me. Once I left my job, I was always planning on transferring my money to Vanguard where I hold my Roth IRA. But when it came time to do it, I felt like there were some things I wasn’t considering. I’ve only worked for one company since I graduated college so all of this was new to me. I’ve read about rollovers and how they work and the basics seemed pretty simple. You have the option to rollover your 401(k) to an IRA with another company, roll it over to your new 401(k), or leave it at your current employer. With the rollover option, you can either keep it pretax as a traditional IRA or roll it over to a Roth IRA and pay taxes on the conversion (yikes!). I knew that I didn’t want to convert to a Roth since I’d have to pay taxes. And because I worked for a top Fortune 500 company, my 401(k) plan was pretty solid. They had a wide variety of choices and ultra low fees. Although there was a monthly $2.55 account maintenance fee, that only amounted to an additional expense of 0.03% on a $100,000 portfolio. If my old plan would have had high fees or poor/expensive investment choices I would have definitely rolled it over, but having a good 401(k) plan made the decision a lot tougher (as long as I kept $1,000 in the account, the account would remain active). Does a IRA Rollover Make Things Simpler? On the surface, having all your retirement accounts in one place seems like a good idea but there are a couple things to watch out for when converting a 401(k). If your income will be high enough in the future to exclude you from Roth contributions then holding a traditional IRA will eliminate the backdoor Roth option for you. Since tax law doesn’t allow people with income over a certain amount to contribute to a Roth IRA or deduct traditional IRA contributions, they’re forced to do what’s known as a backdoor Roth. Since there’s no income restriction on converting to a Roth, the backdoor Roth strategy requires the investor to make non-deductible IRA contributions and then convert them to a Roth. If you’ve got a big traditional IRA lying around though, this backdoor method won’t work since non-dedutible and deductible contributions are all treated as a single account. This is known as the pro-rata rule and it basically prevents you from doing a backdoor Roth if you have a traditional IRA in your name. One smaller thing to watch out for is that if you ever need to borrow from your IRA, you would only be able to do a 60-day loan. But with some 401(k) plans you’re often allowed to borrow for much longer periods, even after you leave the company. Although it would be nice to roll over my 401(k) to Vanguard, they don’t offer anything in terms of rollover bonuses. Companies like Fidelity and TD Ameritrade offer up to $600 (for account balances greater than $250,000) just for rolling over your 401(k). Their funds might not be as inexpensive as Vanguard but they’re not that far off. One thing to watch out for though is that some of these companies charge large fees to close IRAs. I still have $200 left in a TD Ameritrade Roth IRA because I refuse to pay $150 to close my account. I don’t know if I would recommend rolling over to one of these companies but the bonuses definitely make it tempting. Ultimately, I decided on keeping my 401(k) where it is right now. I’m not in any big hurry to get it out of there and complicate my life. Although I’ll now have two 401(k)s when I find a new job, if the new one ends up being similar I could just roll it over there. I won’t know for sure though if my new 401(k) accepts rollovers until I get a new job and take a look at their plan. The problem with rolling over a 401(k) is once you do it, you can’t ever put it back in the exact same spot. At times, the government doesn’t make it easy to save money for retirement so it’s up to you to know all the rules and regulations. Ultimately, if your 401(k) is a good plan, it might be in your best interest to keep it there and keep your options open. Have you ever done a 401(k) rollover? What would you do in this situation? I would definitely rollover your 401k. The only issue whether it should be Vanguard or some other company. I would consider the cost of maintaining the account for probably more than 40 years and the associated expenses. You could rollover to a company that pays a bonus and then move it to Vanguard. I think Vanguard is the best option for me, especially since I already have my roth with them. The cost will be pretty low since I have nearly 6 figures the added expense ratio is only an additional .04% per year..
+1 for rollover. I’ve had at least 7 different 401ks so far, with more to come, and rolled every one into my rollover IRA. Sure, there are risks to holding it in a single institution, but I trust Fidelity, Vanguard, etc. with my hard earned money more than I would my previous employer. In addition, depending on who your 401k is with, they likely have lower expense fees. The only real risk to rolling over, is making sure the 401k sends the money to your rollover IRA, and not to you. It’s rare, but mistakes happen, and if they send you a check in your name, you’re doomed – have to pay taxes on all that plus the early withdrawal penalty. Wow that’s a lot haha you should be an expert by now 🙂 I don’t really mind the risk of holding it in one place, I just don’t like the flexibility that I lose by rolling it over. For example the loan issue and the backdoor roth ira issue. I think I would have arrived at the same conclusion. Sometimes you can be a wise guy and move your money over into your new 401k or roll over into an IRA. But often it makes sense to leave it right where it is if the fees are low, the investment firm is solid, and options are good. I agree, if it ain’t broke, don’t fix it right? I think my new plan will be pretty comparative to my old one so we’ll see how that all shakes out in a month or two. Good analysis, though I generally favor rolling over a 401(k). If your former employer has a solid low cost plan as you mention it is not a bad decision to keep the money there however. One caution though, as you switch jobs again in the future be careful not to have retirement funds in too many spots. I see this all too often with clients as they reach their 50s and it can get complicated. Another point if your new employer’s plan has a Roth option I would suggest maxing your contributions there vs. worrying about converting existing money. You are young and it can work out but you still need to have outside funds available to pay the tax, and you have to determine if this is the best use of those funds. Lastly, in my opinion, an incentive is among the worst reasons to choose an IRA custodian. Thanks for the advice Roger, I like the roth option in the 401(k) but then that would limit my pre-tax contribution which I think is silly not to max out if you can afford it. Harry I find my self confused by your reluctance to contribute to a Roth 401(k) if one was available to you because you don;t want to give up tax-deferred contributions. Yet at the same time you are so concerned about preserving your ability to do a Roth conversion with its accompanying tax liability and the need for cash out side of the plan to pay the taxes. I don’t get it. Let me echo what Roger said. I’m now in my 50s and have multiple small 401s and pensions scattered all over the place not because that’s the best option but because I never got around to rolling over and now I can’t remember my passwords and logins… Which makes me keep putting off the chore of rolling them over. If I get hit by a bus tomorrow, my wife will never know they exist. As I get older, this becomes more important to handle. You do not want a bunch of accounts you need to remember logins for (and that need to be periodically changed for security reasons) when you’re in your 50s and have a ton of other kid-related responsibilities. I just started a new job and I am thinking about a rollover. With people changing jobs so often these days, how do you suggest they keep track of all these accounts if they do not roll them over? This was my first job so I only have one 401(k) but if I had multiple and didn’t want to convert to an IRA then you can usually roll over old 401(k)’s into new 401(k)’s. Otherwise, the same way you keep track of all your other accounts right? Either by memory or use a simple excel spreadsheet would be my advice.. I have all my accounts in Mint so it’s pretty easy for me. Are you age 55 but under 59.5 in the year you leave your company? That’s a reason to keep the 401(k) in place rather than roll it into an IRA or your next 401(k). If for some reason you need to take money out, there is no 10% penalty for early withdrawal. In an IRA there is a 10% penalty until you reach 59.5 (unless some other exception applies). Not performing a rollover due to the ability to take a loan from the 401(k) is misleading. Plan sponsors will not allow you to take a loan from a 401(k) plan when you are no longer employed with them. Also, why leave retirement funds in an account where your former employer determines the overall investment mix to choose from? Also, if the company ever ran into financial issues, the plan can be terminated and your funds frozen in the plan until the IRS gets around to issuing a letter of determination(which can take more than 6 months). In my opinion, there are way too many risks to maintain a financial relationship with a firm once you have cut ties with them. I rolled over my Low cost Fidelity 401k to an actively managed Merrill Lynch IRA last May after retiring. So far, it has been a bad move. The index funds I had are outperforming my financial manager. Had I done nothing, I would have now have a positive return vs my rollover balance where my new IRA is still over 5% negative. You make an excellent point that you can’t put the funds back into the 401k once they are rolled over. If I could I would. I am going to give the actively managed IRA more time but if the current trend continues, I will be looking for other alternatives. Why did you choose an active manager? You can easily roll over your IRA to any IRA provider and invest in low cost index funds (even at Fidelity). Check out our top choices for low cost IRA accounts.